What different grinds on these two similar gouges? New to turning, I recently completed a 20-hour course. After reading here a lot, I got a set of BB, which included a 3/8 inch bowl gouge, and to make myself feel better (i.e. I was not spending enough), I also splurged on a 1/4 inch Henry Taylor bowl gouge, thinking to use it as a block plane to the 3/8 smoothing plane (got the analogy out of a 1978 FW book). However, when I got them, the 3/8 BB and the 1/4 Henry looked like the same size, other than the flute geometry. I then read that manufacturers size them a bit different. So, I thought, I might as well put a different grind on each one, and see what I like to use better. 1. Can I get some advice as to which one I should put a more swept back grind? 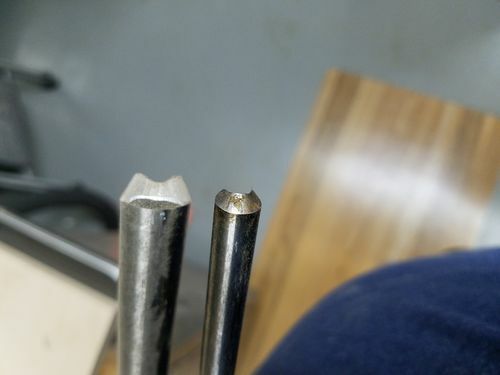 The course I took, used bowl gouges with a more swept back bevel than the grind that came with the gouges. 2. Also, for my spindle gouge, the one I used during the course was very pointy, the one I got from BB is much rounder. Should I need to grind it to a point? We used it a LOT, more than the bowl gouge. A lot is your preference. The BB looks like pretty much a standard grind. The HT is more of a “bottom feeder”. With a bottom feeder the bevel is shorter to get around tighter curves; it is also more of a U shape which presents a more slicing cut. It also has the wings ground back very little but it is easier to catch the top of the wing making a nasty catch. If I reground one it would be the BB to be more like Stuart Batty’s 40/40 grind. Hard to say on the spindle gouge since there is no pic. I “suspect” the one you used in class was a “detail spindle gouge” instead of a standard spindle gouge. If you to go Doug Thompson’s tool site he has pics of the spindle, dietail spindle, and shallow detail spindle gouges. Most folks put a more pointed grind on the detail spindle since it is designed to reach into tighter spaces. Because there is more steel left under the grind the detail spindle is a little stronger than a normal spindle gouge allowing a little more overhang on the tool rest. I would leave the spindle as is until you give it a good workout. BTW your Henry Taylor is UK made and on Bowl Gouges ONLY they measure the size differently. In US they are sized by the diameter of the shaft; in the UK it is a diagonal from the edge of the far flute to the outside diameter of the other side. UK made gouges are about 1/8” larger so a US 1/2 and a UK 3/8 are about the same size. Other popular UK brands are Sorby, Hamlet, Ashley Iles, etc. A few companies spec their bowl gouges in the UK fashion such as Hurricane and Packard (made for them by Hamlet). Thanks for your most illuminating reply! 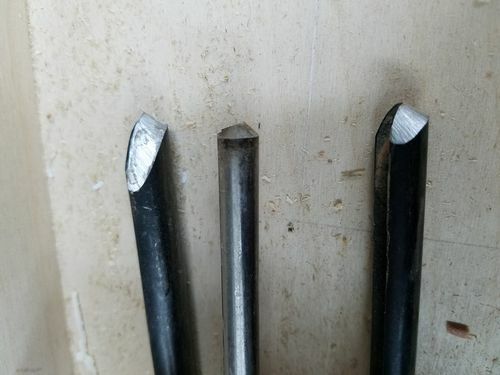 I found Doug’s picture and indeed the steel/tool itself seems different between the “spindle, detail spindle, and shallow detail spindle gouges”. However, I see that the standard gouge that is carried by most, is the regular one. 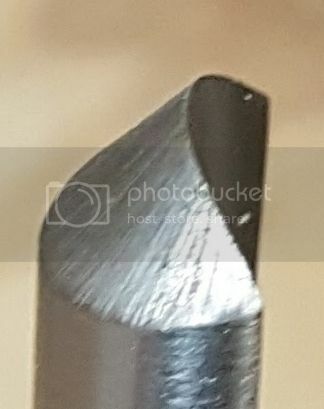 Can I grind the one I have (pic below), to a more pointy point to make it like the one I was taught on? Already stated how American & English gouge meassurements differ by 1/8”. Not sure about online but both Craft Supplies & Packard Woodworks tell you that information. P & N tools sold here in MM’s. Traditional or square grind comes on both spindle or bowl gouges when new except when you order a gouge with either finger nail or side, Ellsworth, or Irish ground tool. Best way to get the same grind everytime you sharpen your tools unless adept at freehand sharpening is buy or make your own jig. 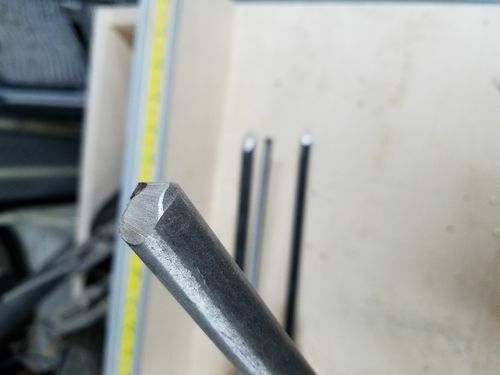 I use the Wolverine system which allows you to put either fingernail or side ground bevel on your tools. Or lot of folks just buy or make themselves an Ellsworth jig. JMHO, can buy just the basic Wolverine system for about $90 from many vendors. I have the optional Var-Grind Jig. Just the Ellsworth jig will set you back $45. There are other jigs you can buy but cannot speak too because never used them. There are plenty of online videos which show how to produce either fingernail or side grind on your gouges. Stay way from actual bevel angles due to bowl design, some bevel angles better than others for each person and bowl design. Hi Bill, thanks for replying. I actually had a WS3k already for my other blades so I just needed to add the tormek bowl gouge jig for it, so I am set as far as jigs. My problem is to what grind to actually grind them :). Yep, it you want it more like the one you learned on then go ahead and re-grind it. You may well feel more comfortable with it when re-ground. I re-grind most of mine sooner or later. I would put the more swept back grind on the BB. The grind that is on the HT is very good for getting into a tight deep turn. Like a cup or vase. You can see this gouge has a similar grind as your Henry Taylor. The larger has an added micro bevel on the bottom that allows an even tighter turn. Best article ever read with better illustration was Ask Dale, in Woodturning design magazine and cannot be found online anymore. I still have the magazine article and refer to it once in awhile takes me long time to find it. If scroll down to bowl gouges kind of answers your question. Not sure if this gauge will help you, I use the vari-grind jig and follow instructions that came with it more than twenty years ago..
...[snip]... Best way to get the same grind everytime you sharpen your tools unless adept at freehand sharpening is buy or make your own jig. I use the Wolverine system which allows you to put either fingernail or side ground bevel on your tools. Or lot of folks just buy or make themselves an Ellsworth jig. More on DIY sharpening Jigs… Here is what I ended up making/converting from a belt sander. Since this is a belt sharpening system, it works very well sharpening hand plane cutters and chisels as well as lathe tools. While I bought several grits of sanding belts, I found that I never needed any more than 180 grit. I converted the sanding wheel into a buffing wheel and use it with 10,000 grit polish, for mirror finishes. +1 on making jigs to help with the reshaping and sharpening. I too would leave one of the gouges with the traditional grind to help with the bottoms of bowls and other hollow forms. I found this Sorby YouTube video helpful to understand the steps to reshape or fix a gouge. Obviously this is using their grinder and jigs but the process is basically the same with other grinders and jigs. Think that Sorby system is over priced, but if have to have it go for it. Not all vendors offer a six piece set so be carefull. Also there are less expensive belts both AL and zirconium out there. I get my AL & zirconium belts at Klingspor’s Woodworkers Shop for lot less for my belt sander. Think Mike right on the money with his homemade jig & inexpensive belt sander. I’ll stick with my bench grinder & Wolverine set up. I agree that the sorby grinder is way too expensive. That’s why I built my own belt sander and sorby-esce jigs instead. I only recommended the video because it does a good job explaining the steps required to reshape the profile of a bowl gouge. Does anyone know what angle the grind is on the BB gouge, I have one and was going to get the Raptor set up tool but wasn’t sure which angle it is, i’m thinking its the 45 degree?